Plate one from A. E. Scott's 'Simla Scenes'. Prince Waldemar of Prussia was an amateur artist and visited Simla in 1845. 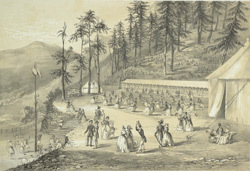 He arranged a grand outdoor entertainment at Annandale, "a spot of beautiful table land amidst the wild scenery", in return for the many balls and fetes organized in his honour. Scott describes the event like this: "Tents were under the trees, and at the foot of a Pine-clad Ghat [slope] a sumptuous banquet was spread beneath a vista of rose and white drapery. A good band promoted dancing, and as night drew on lamps shone from the branches of the surrounding forest. Prince Waldemar's liberality extended to the hill villagers, who were permitted to display their gambols on a piece of ground below, where a tall pole was erected, at the top of which hung a brass vessel containing fifty rupees and several pieces of Hindoo cloth ... Crowds of natives contemplated this peculiar scene of magnificence and rural festivity."